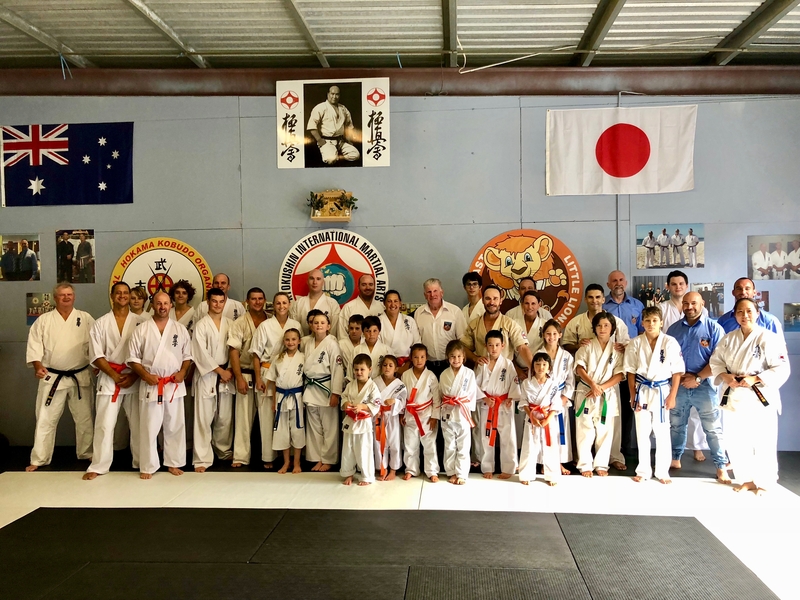 Ballina Dojo now has a new home – St Francis Xavier School Hall. 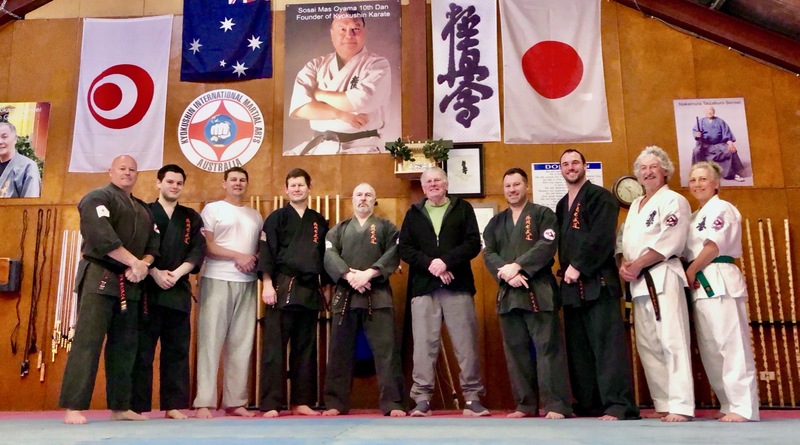 Training at the new location began on Monday August 20th with dojo operator Sensei Jon Ellis. A grading was held there for junior grades soon after moving in. The new space is an expansive upgrade, greatly needed due to the increasing class sizes in Ballina. The address and new timetable are listed below. If you’re not sure what class you should attend, please contact Sensei Jon at the number below. Address: St Francis Xavier School Hall, Cherry & Crane Streets, Ballina 2478 NSW. 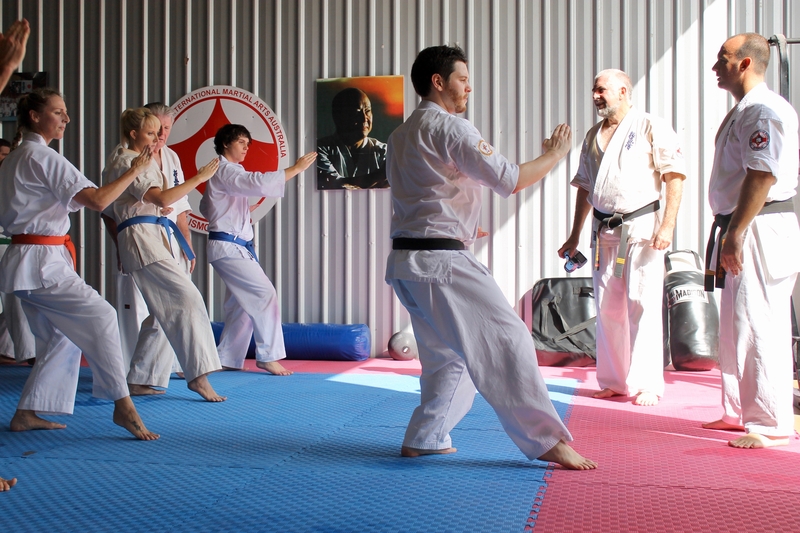 A Kyokushin Karate Black Belt training session was held on the afternoon of Saturday August 11th at Turramurra Dojo. Over a long afternoon, Hanshi Howard Lipman took the KIMAA Yudansha through kihon, partner drills and fighting technique, advanced techniques and various senior kata. 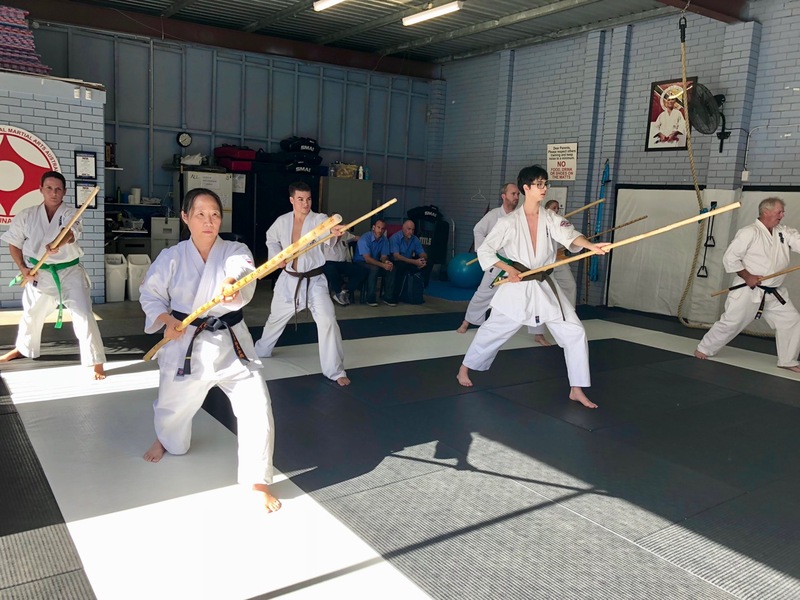 A Kobudo class was held at Annangrove Dojo on the Sunday morning. The class was divided into beginner, intermediate and advanced groups. 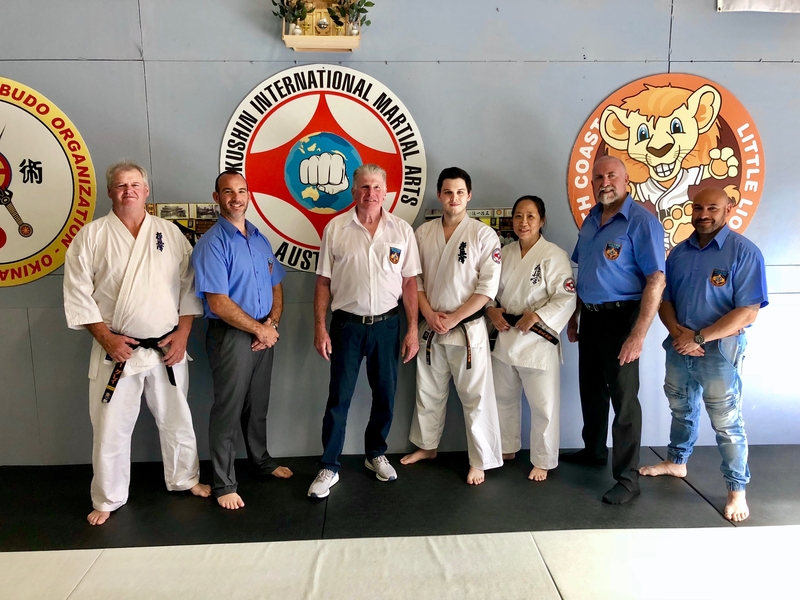 The session was conducted by Shihan Rick Cunningham, while Hanshi Howard Lipman assessed the cohort for grading. 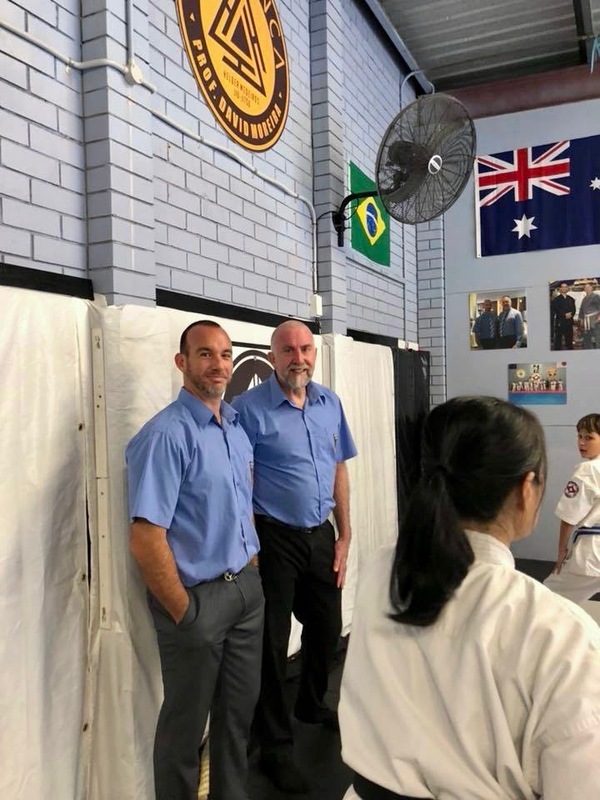 Two students were promoted by Hanshi Howard: Sensei Alex Lloyd received his 3rd Dan and Sensei James Sidwell his 2nd Dan. Special recognition go to Sensei David Craigie and Jeanette for travelling from Young Dojo to make the weekend sessions. 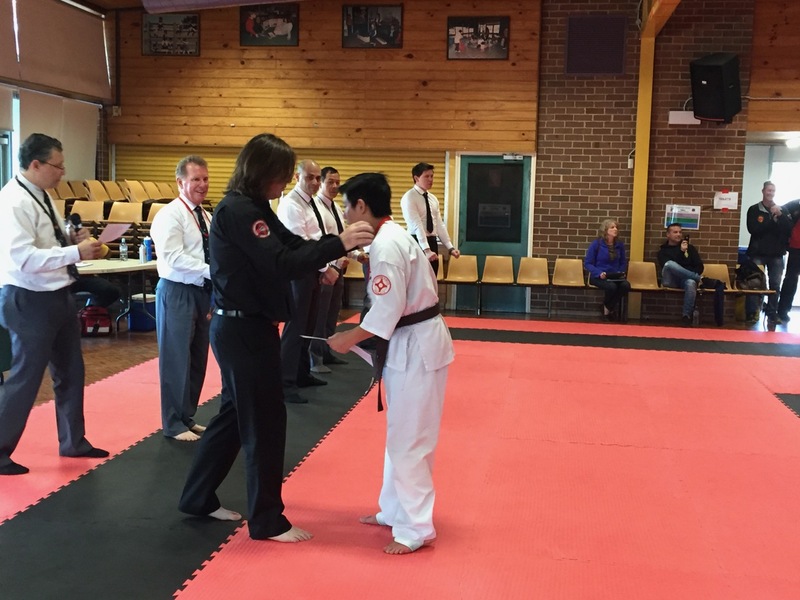 And congratulations to the two promoted Kobudo yudansha. 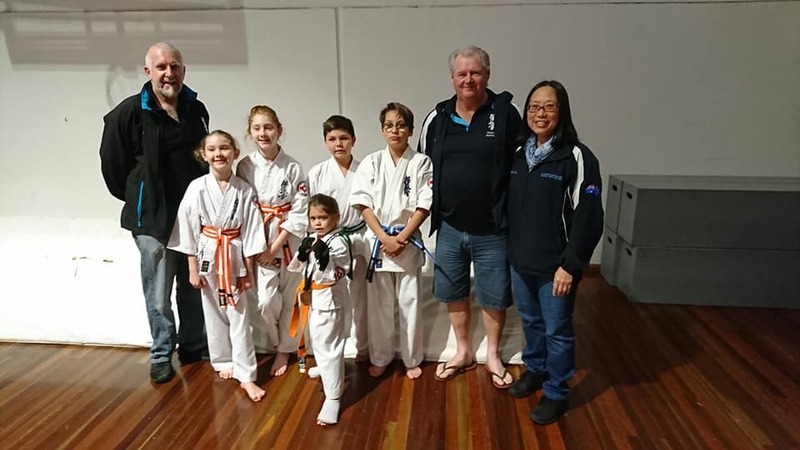 Students of Lismore Dojo competed in Round 3 of the National All Styles tournament in Queensland, on July 22, 2018. Sensei Mark, Sempai Wally and Sempai Trish with their students. 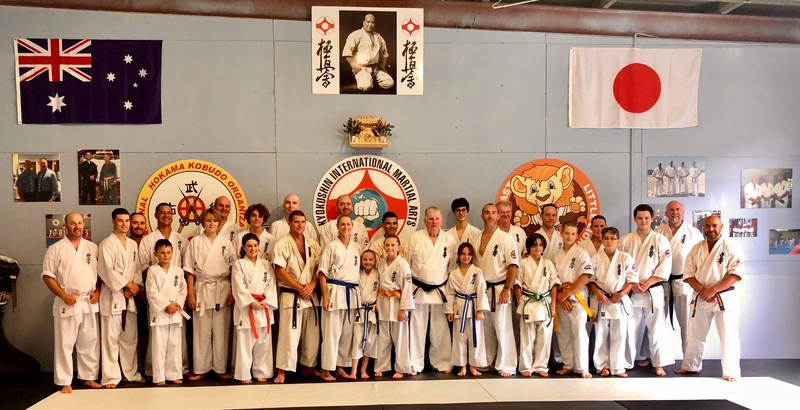 The Little Lions were under the mentorship of head instructor Sensei Mark McFadden, as well as Sempai Wally Gray and Sempai Patricia Tan. In the girls divisions, Evie, Olivia and Akayla competed, with Akayla winning an encouragement award for her first competition in point sparring. In the boys, Isaac and Clayton both displayed a great effort in the Kata and Continuous Sparring divisions. Congratulations to all our young KIMAA competitors. 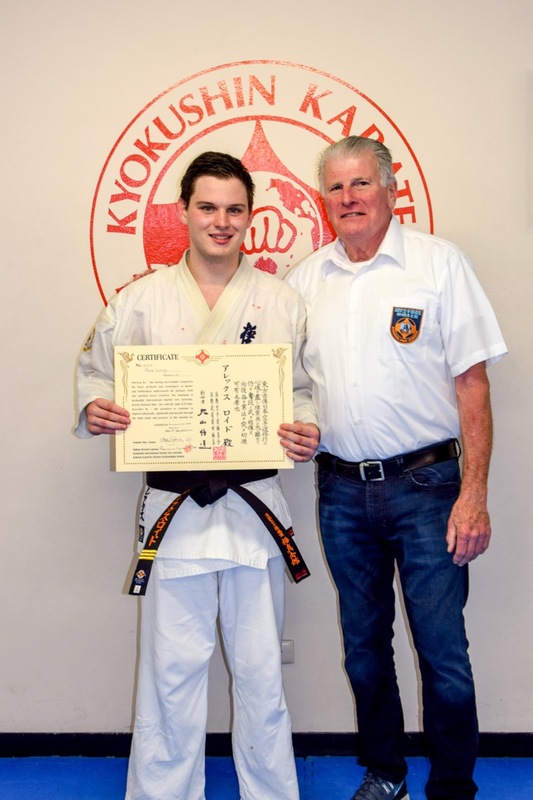 Alex Lloyd was promoted to Sandan – Sensei – after 13 continual years of training. Alex is well respected by all those people who have grades above and below. 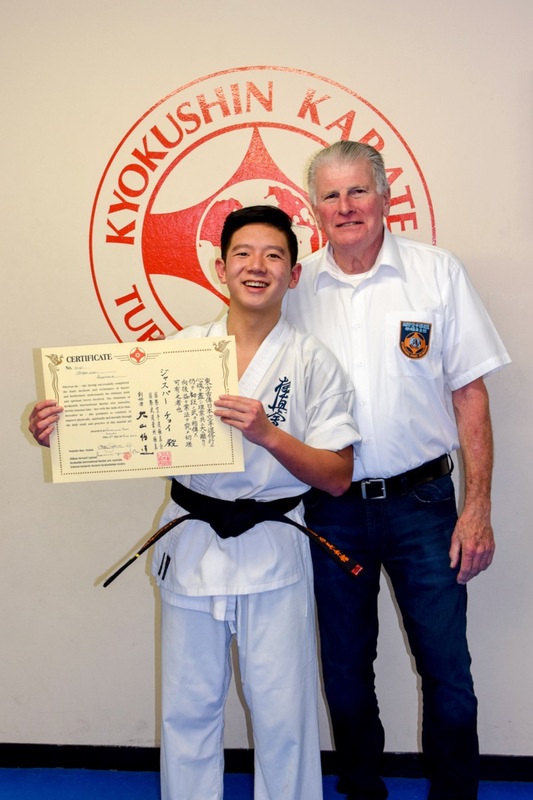 He has become an excellent teacher and has an in-depth knowledge of Kyokushin, its history, techniques and principles, as were taught by Sosai Mas Oyama. He now takes his place in the dojo within the ranks of Sensei in the KIMAA organisation. Sensei Alex is also Nidan (2nd Dan) in the International Hokama Kobudo Organisation, and will attempt his Sandan in Kobudo later this year. 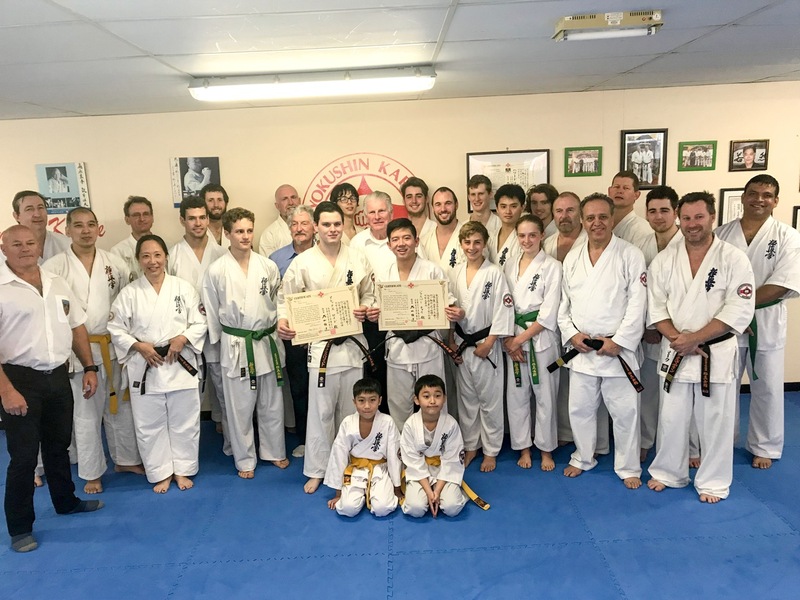 An essay written by Sensei Alex Lloyd for his Sandan Grading (June 2018). Sensei Alex Lloyd, with junior grades following, during the senior grading. 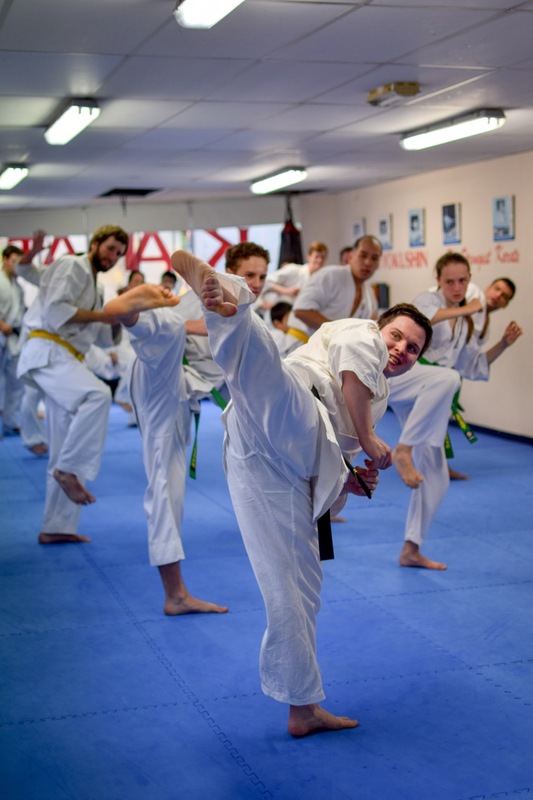 The journey of the karateka is always one of self-improvement, for “Behind each triumph are new peaks to be conquered,” in the words of Kyokushin founder Sosai Mas Oyama. 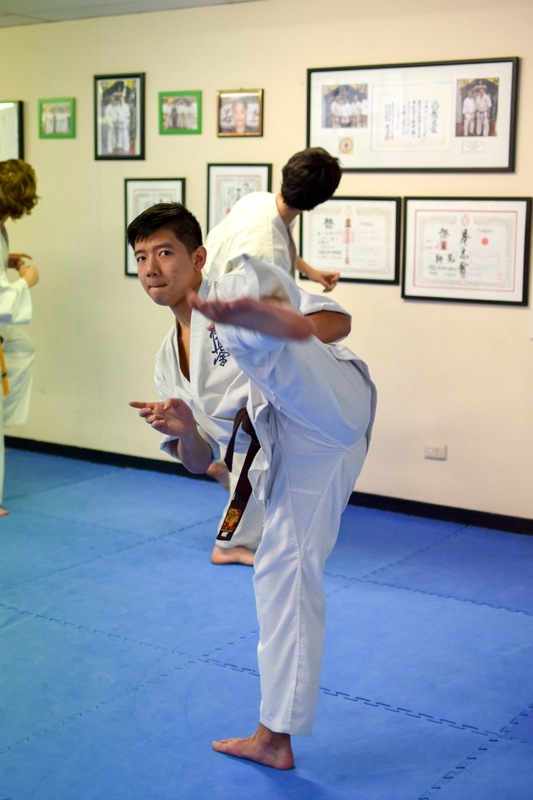 Junior students have a singular focus of becoming better martial artists, while a teacher must have dual focus: still pursuing self-betterment for their own ongoing progression and, more importantly, the moulding of their students from beginners into martial artists. 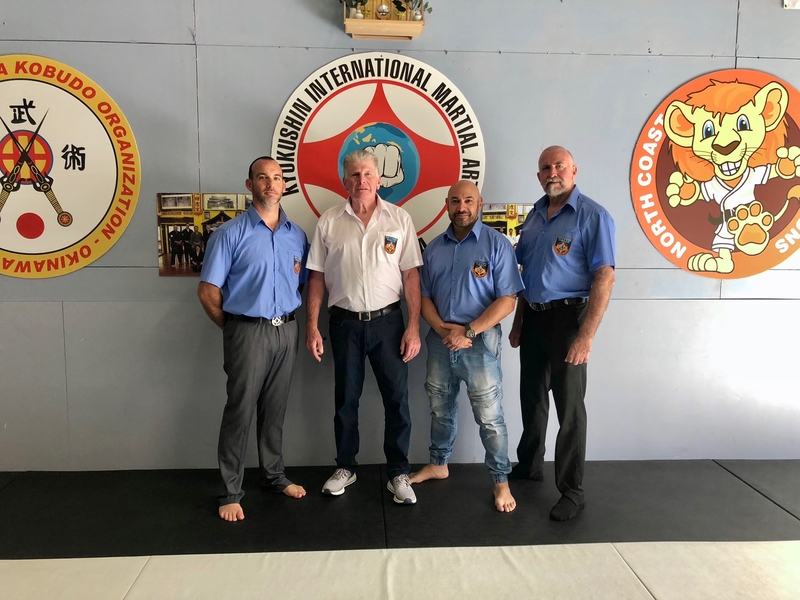 I have found instructing classes integral to my technical development as a martial arts practitioner, expanding my understanding of Karate beyond its sporting component, and that instructing has had a marked effect on my personal growth. This essay seeks to explore the importance of a teacher being a good role model, having technical proficiency and an understanding of Karate spirituality; and how the pursuit of these as a teacher further develops one to another level of martial artistry. It is my strong belief that the role of Sensei or Shihan is beyond one of just technical mastery, but is the ultimate embodiment of budo. A good teacher is a role model to their students. The foundation of this principle begins for the white belt in their first lesson. We are taught early in Kyokushin that the student must aspire to be like the senior grade next to them. This continues through the lines of the class to the senior student, who aspires to the skills of the instructor out the front. 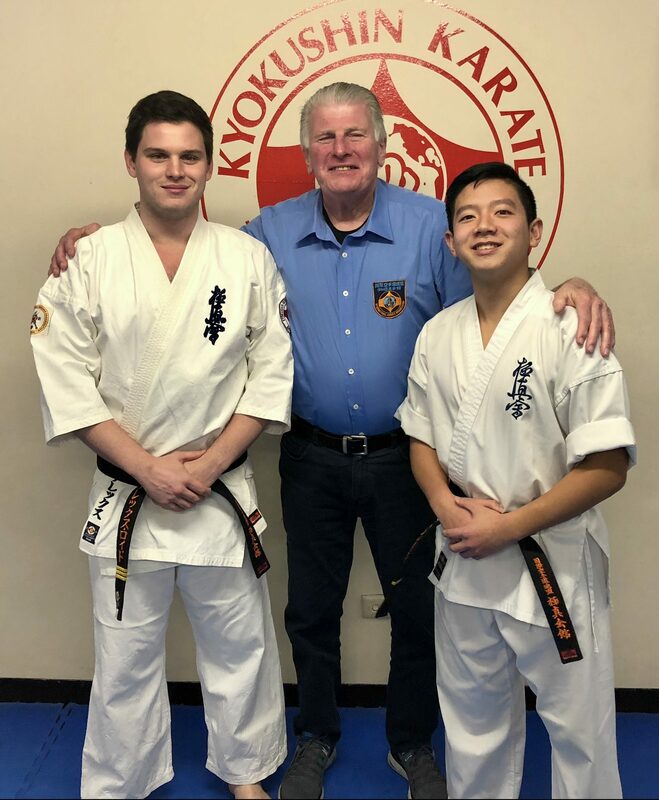 In Kyokushin, a student’s progress is measured against a standard benchmark (as defined by the syllabus) as well as on an individual basis, against each student’s own ability and improvement over time. While the ultimate test may be against oneself in a grading, a senior student or instructor serves as a beacon for the junior’s next goal. This means that the quality of the kyokushinkai stems from the teacher. If the Sensei’s standards are low, then the Sempai only has so much they can pursue. Subsequently, the next student can only improve to a limited degree, and so on down the class. Our hierarchical system of training depends on a high, strong capstone at the top of the pyramid. This in turn will produce strong students; strong foundations. The highest responsibility of a teacher is always to live up to their part as a role model. Sensei Alex during his Sandan grading. This should not be seen as a burden or pressure. “One must try, everyday, to expand one’s limits,” said Sosai. Junior students have a reprieve that only their fellow kohai and the Sensei’s eyes are watching them. The further one advances through the class, the more students are watching, both to copy technique from and also to chase to try and surpass. This is an additional motivation to always train at one’s best rather than just go through the motions. This is felt to the greatest degree by the teacher, for all eyes are on them: “We will look upwards to wisdom and strength,” – the Sensei must be the source of wisdom and strength to which the Dojo Kun refers. 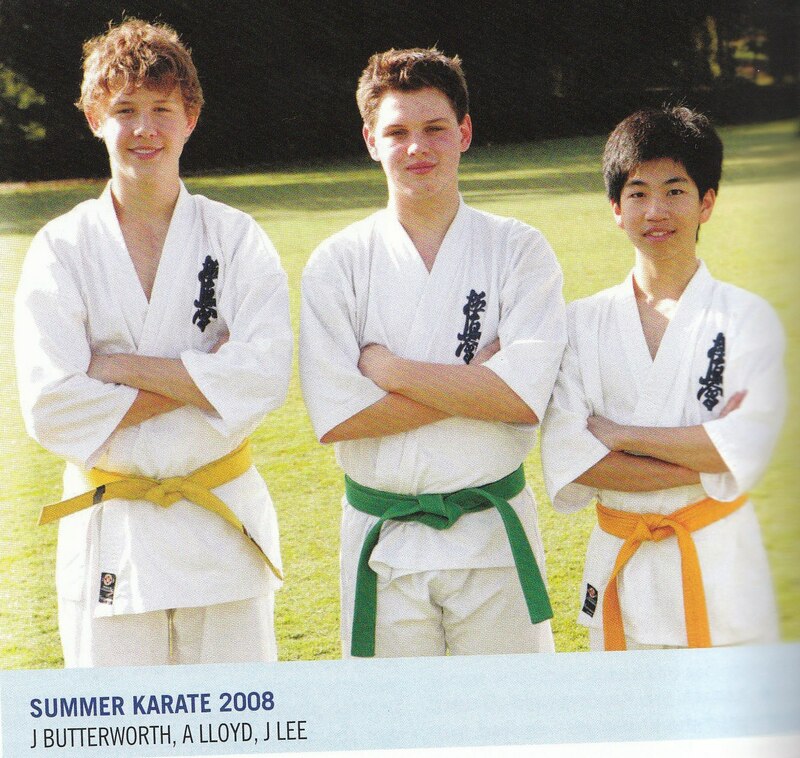 I began teaching classes as a senior high school student at 3rd Kyu, through the Knox Karate program. At first my instructor, Hanshi Howard Lipman, would remain in the class – to oversee me and correct the techniques of students where I missed their mistakes which, at first, was frequently! I was certainly nervous when I started instructing, for I had a number of capable senior students whom I regarded as having more natural sporting ability, coordination and technical flair than me; not living up to being the role model, especially technically, was of great concern. 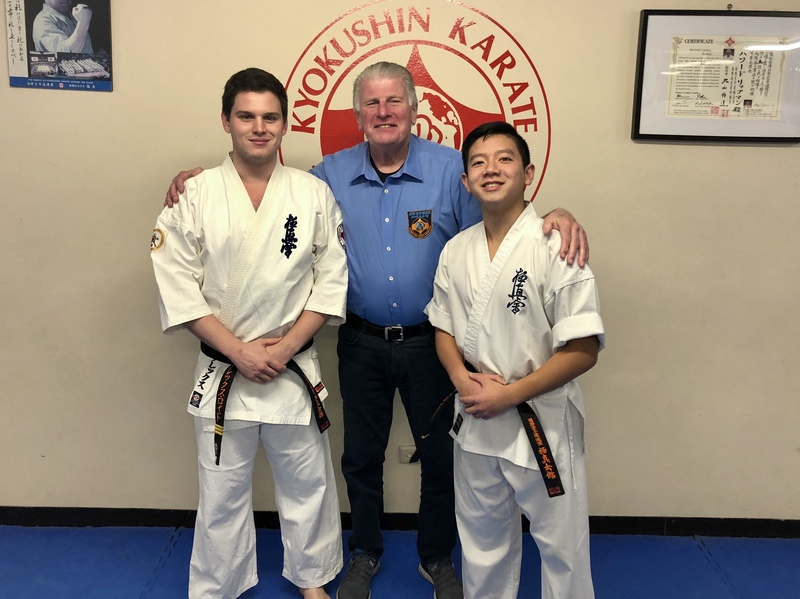 Comparing me to the instructors who usually taught the Knox classes at the time – Hanshi, Sensei Allan Engelin and Sensei James Sidwell – would clearly showcase an obvious disparity in ability. But the responsibility of teaching drove me to train harder and more often. I increased my level of practise at home, as well as the number of classes I attended outside the Knox program. Teaching made me work harder at my techniques, as well as improving my self-confidence. In turn, as I felt the students’ respect for me increase, this only positively reinforced my training. After a time, Hanshi was happy to occasionally do paperwork in the office while I taught, or have me cover a class completely solo if he was unable to attend. In the context of Knox Karate, I started to feel like a role model. Naturally, though, there’s always another level to pursue in the martial arts. For me at that time, it was the General Class, where I was still quite junior. 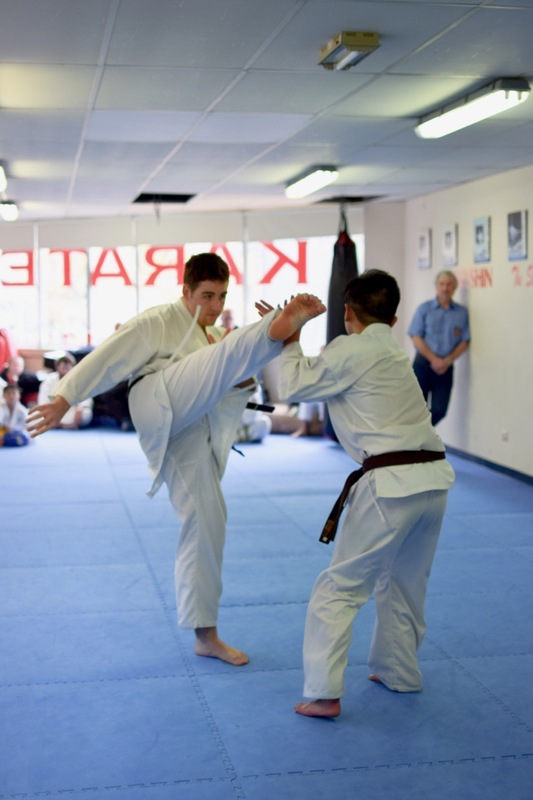 Sensei Alex blocks a kick and takes down his opponent during the IFKKA September 2015 Tournament. Alex placed Third in his division. 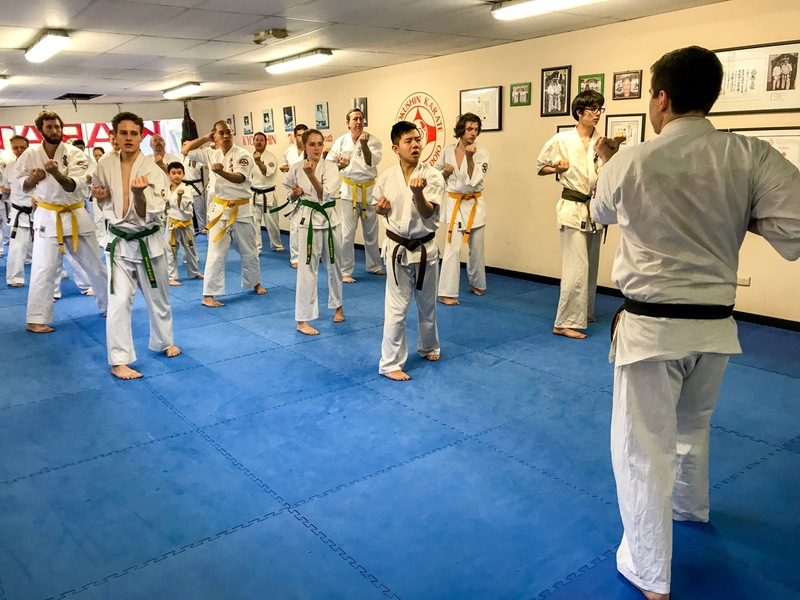 A dedicated and adept teacher who serves as a role model for all members of the dojo is fundamental to uniting a Karate class to train hard and continue to pursue self-improvement. 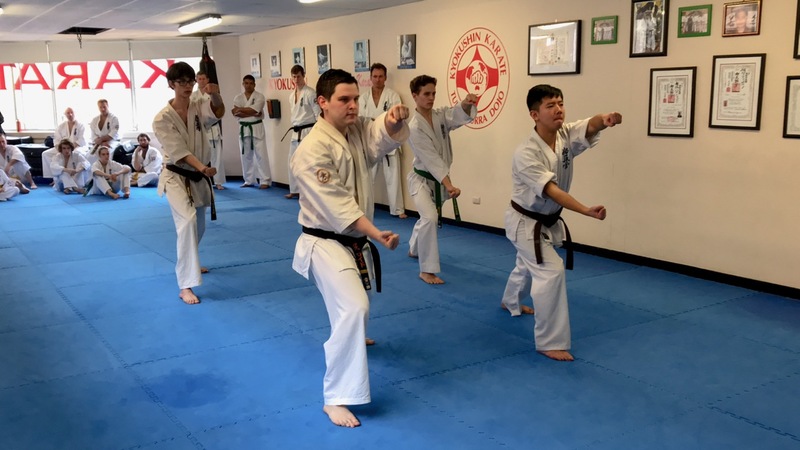 In the words of Shotokan Karate-Do founder Gichin Funakoshi, “Karate is like boiling water: without heat, it returns to its tepid state.” The teacher living up to their duty as role model provides that heat. Sensei Alex demonstrating during the 2017 North Coast KIMAA Seminar. 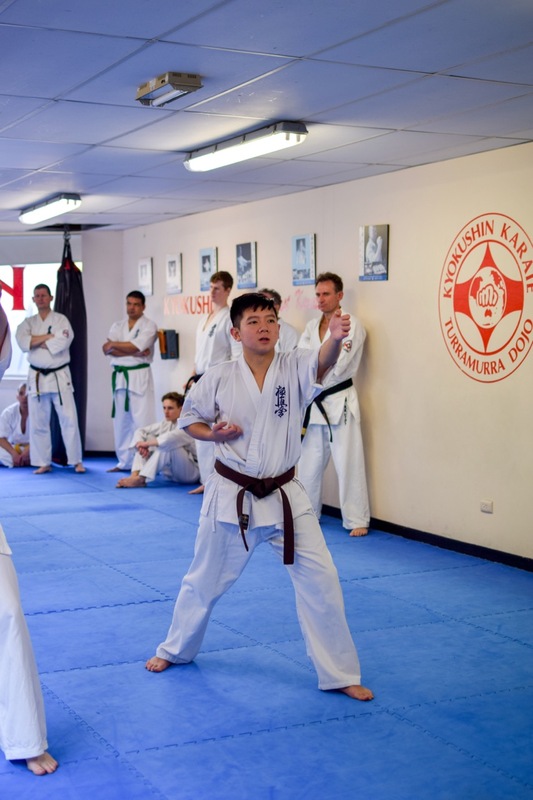 A good teacher of Karate does more than just drill techniques into their students – a point to which I will return – but the foundation of correct technique is a vital component for any martial artist. 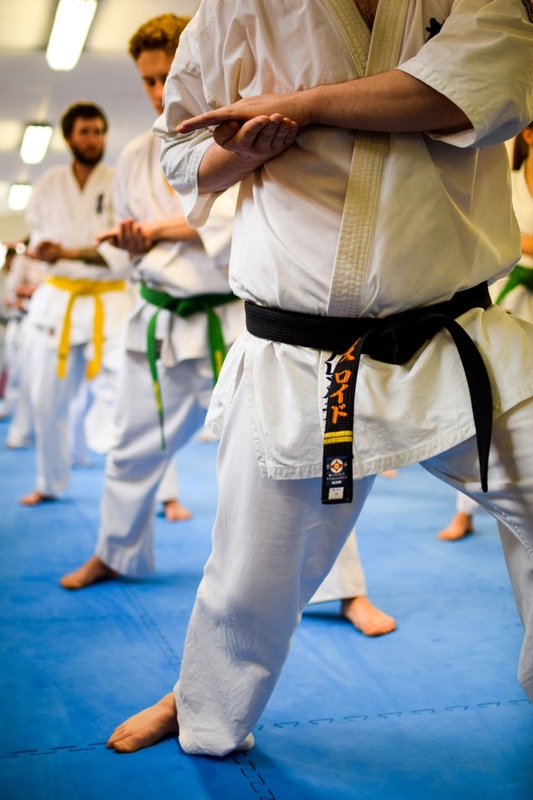 In this sense, ‘technique’ encompasses all executed movements in Kyokushin – strikes, blocks, kicks, stances – as well as composite movements and patterns – ido geiko, combinations, kata, bunkai, fighting manoeuvres and all levels of kumite. The logic of the importance of a teacher as a technician stems from the teacher’s ultimate responsibility of being a role model: the teacher must display, understand and be able to explain every technique to the highest degree of accuracy and skill, so the class has a standard for which to strive. 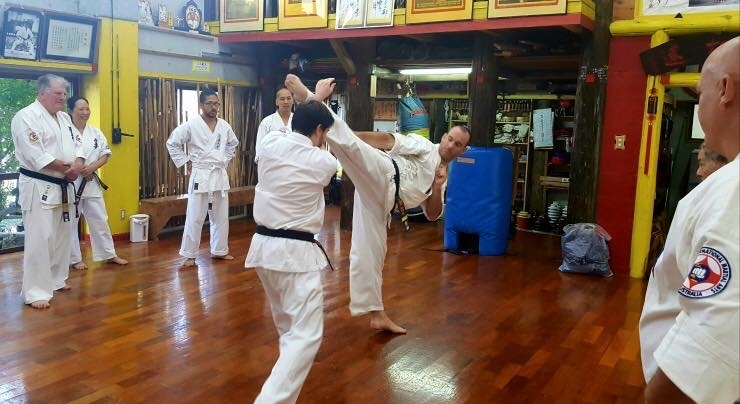 Sensei Alex blocks a kick from Sensei Jon Ellis, at Sensei Hokama’s dojo in Okinawa, January 2017. The high technical ability is a prerequisite to being an instructor, achieved through years of, as Sosai simply put it, “training. Train more than you sleep.” Similarly, a Sensei’s fitness level should be above that of the class he or she instructs. Beyond being the correct example for the class, the clarity of thought while under physical duress needed to teach is best attained through fitness. In turn, a strong foundation of fitness enables a better execution of techniques. While difficult and often requiring years of relentless pursuit, technical mastery is the simplest of the three elements of a teacher being a good technician, the other two being understanding and explanation. Understanding why techniques are done the way they are is what differentiates the Karate Sensei from a military drill sergeant. For example, hikite (pulling hand) is not performed for neatness or aesthetic in a sporting sense, nor simply because a book says so. Hikite produces power, whether in a strike or block, which maximises the effectiveness of the technique. It changes the power of the movement being generated from a singular limb. For example, a singular set of shoulder and arm muscles throwing a punch, to channelling the strength of the whole body, right from the ground, into the technique. There is also a potential practical application of grabbing or being grabbed, and pulling in an opponent while striking with the other hand. 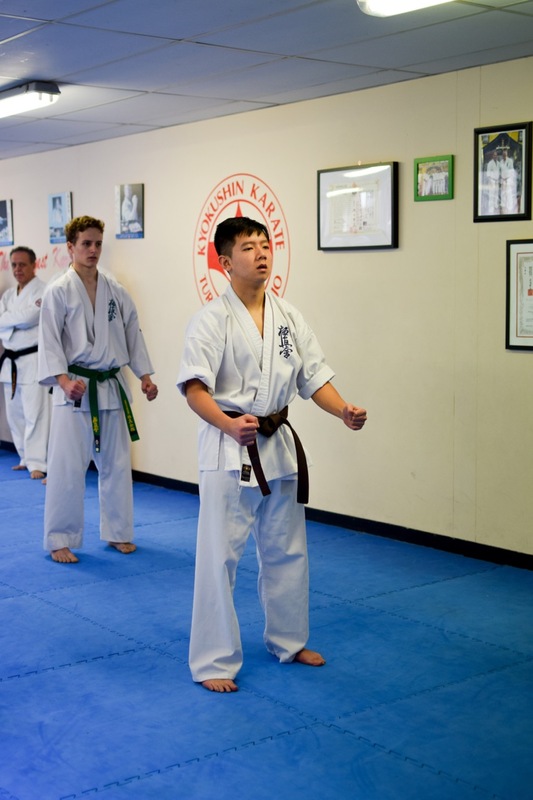 Understanding this and being able to explain and demonstrate the importance of hikite to a class will improve the students’ technique, enhancing their power and kime (focus). This level of understanding also increases the teacher’s ability to correct their students. For example, a good teacher may identify the cause of an ineffective punch as inattentiveness to hikite, whereas a less able teacher will likely try to improve the student’s punch with muscular power, mistakenly relying on strength over form. Hence, a teacher must constantly study and seek an understanding of what they are explaining. Teaching can also reveal to the instructor what they do not know, hence for what they need to seek answers. 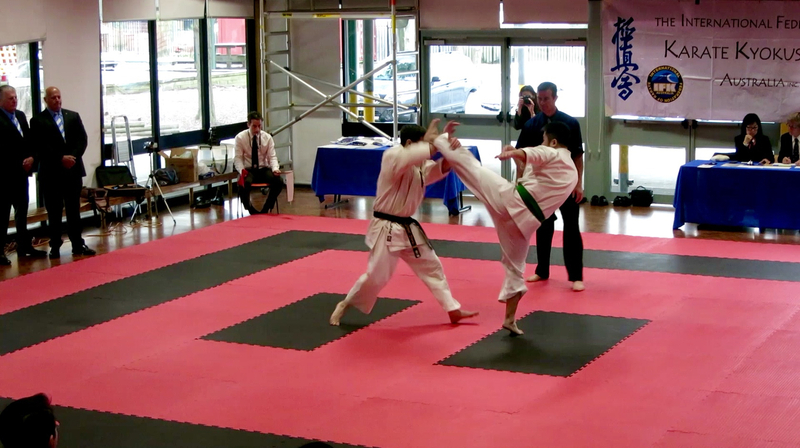 Sensei Alex performs the Kyokushin Bo kata – Chion. I have found that explaining techniques to students while teaching has greatly improved my own Karate. Explaining the importance of angles in a particular posture, weight distribution in a certain stance or how to correctly twist a limb in a block to enhance the power of the parry has made me acutely aware of the nuances involved in these techniques. Correcting the mistakes of students keeps me mindful of avoiding the same mistake as I do the technique. Years of correcting and explaining techniques has also changed the way I think while training. When performing Jodan Uke as a junior kyu grade, I only focused on the end result: arm goes up and blocks the incoming head strike at an angle. Now my technique is faster, yet I have more to think about: am I keeping my arms in an equal and opposite reaction, am I rotating my shoulders 45 degrees with the manoeuvre, is the descending arm perpendicular to the ground as it covers my body, is the ascending arm rotating that extra amount for kime as it locks into the final position, is the finishing angle of the arm correct, are my knuckles pointing to the ceiling, did my obi (belt) flick as I turned to 45 degrees to indicate I used my hips and twisted with sufficient speed, and was I as fast and accurate as the senior grade to my right? My mind checks these boxes on every technique. Karate is an invaluable art to train the body, but it also trains the mind. This can be applied to any basic technique (kihon) in Kyokushin. More advanced components of Karate, such as kata or bunkai have an even greater effect on sharpening the mind, due to their complexity. 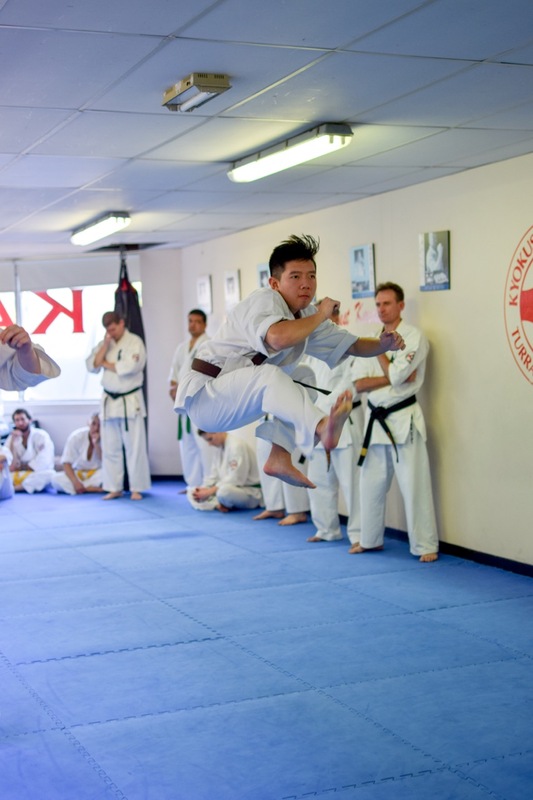 Teaching Karate has catalysed a great expansion of my mental acuity, as well as refining my technical form, further developing my skills as a martial artist. Sensei Alex fights Eric Wright during the grading. A Sensei who is an exemplar of technical precision does not just showcase form, but also a depth of knowledge. 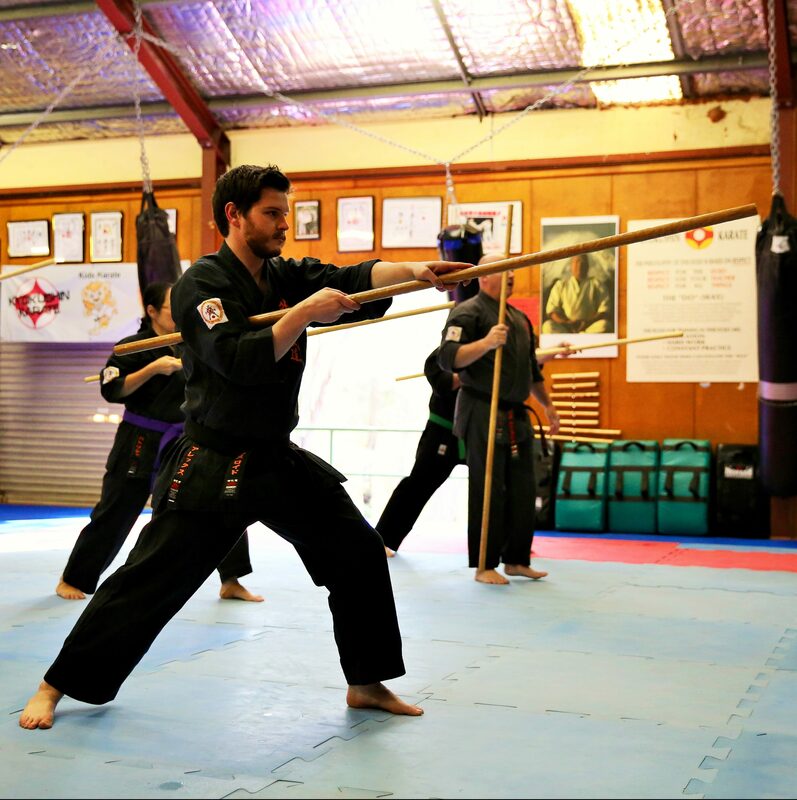 This includes an understanding of why the techniques are performed the way they are, the terminology and the practical application – the bunkai. 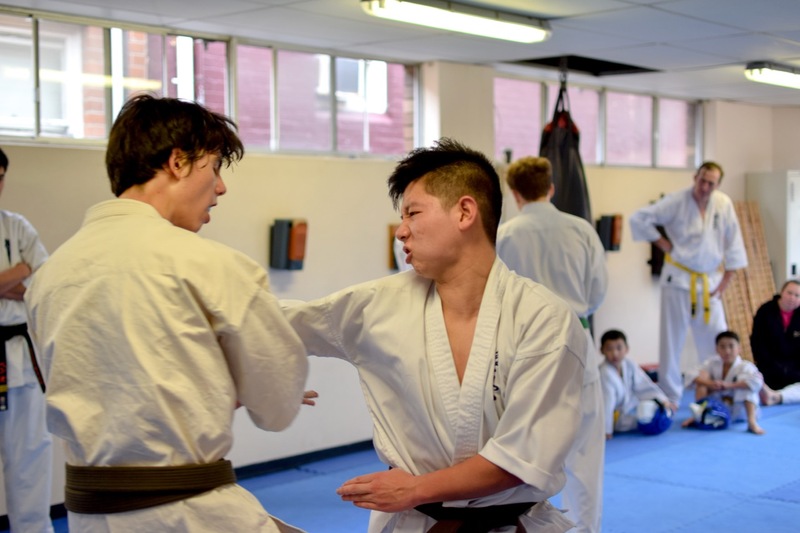 Breaking down and explaining these techniques to students in turn has an effect on the instructor’s ability, as they focus on further refining the subtleties of each action, from a simple block to a takedown manoeuvre derived from a senior kata. The study of the martial arts is ultimately about more than a form of self-defence, but about character. 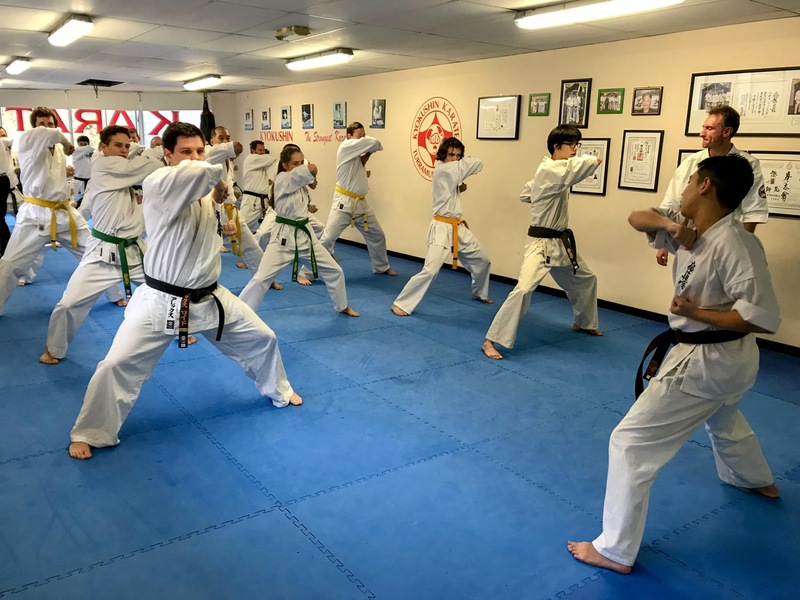 Funakoshi said that the “ultimate aim of Karate lies not in victory or defeat, but in the perfection of the character of its participants.” The Karate Sensei serves as the role model to their students, continually striving to be their benchmark. This is reflected in the meaning of Kyokushin, which is commonly translated as “ultimate truth”. I have been told by a highly educated Japanese speaker that another translation could be “pursuit of the Ultimate Truth”, which is my preferred interpretation. The study of Karate is a journey with an unattainable finish line, but it is the journey that matters rather than the destination. 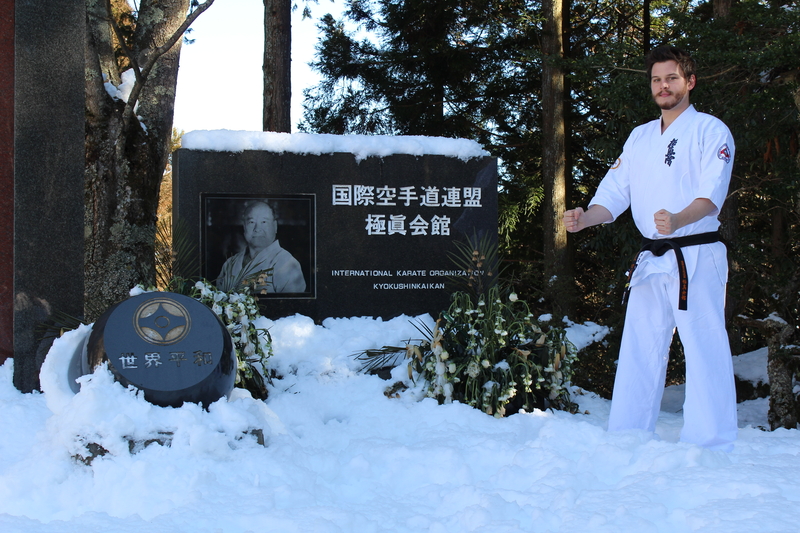 Sensei Alex, barefoot in the snow, at Sosai Mas Oyama’s shrine at Mt Mitsumine, January 2017. The sentiment expressed by Sosai captures that of Karate’s spiritual side. The model karateka is of a well-rounded character; patient, resilient and courteous. There are many quotes by Sosai espousing these ideas: “Courtesy should be apparent in all our actions and words and in all aspects of daily life,” and “The karateka who has given the necessary years of exercise and meditation is a tranquil person. He is unafraid. He can even be calm in a burning building.” A teacher aims to guide their students towards these courteous, “more spiritually focused Japanese Karate [principles],” (Sensei Tetsuhiro Hokama). The teacher who lives with a mindful adherence to the Dojo Kun for themselves and their students will deepen their own martial art spirituality. Sensei Alex after the grading. In my own experience, I believe I have lived by the principles of Kyokushin as best I can. The Dojo Kun has helped me grow in maturity and strength of character, particularly as Karate came into my life during my teenage years. I have failed on many occasions – whether due to hubris, laziness or otherwise – but I hold myself accountable. I have built myself to this point over years of training and teaching, doing my best to be a role model for students not just in technique, but in character. I have learned that “Karate … must be a moral way, surpassing mere techniques,” (Sosai). I believe that Hanshi Lipman inviting me to attempt a Sandan grading reflects that. But, as with technical training, there is always room to improve. Being an instructor also teaches the Karate Sensei to be selfless in their pursuit of the ultimate truth. Ego has no place in the dojo; the show-offs never last in a reputable dojo. One can pursue a sense of achievement and use that as a source of motivation, but pride is not the goal of training. 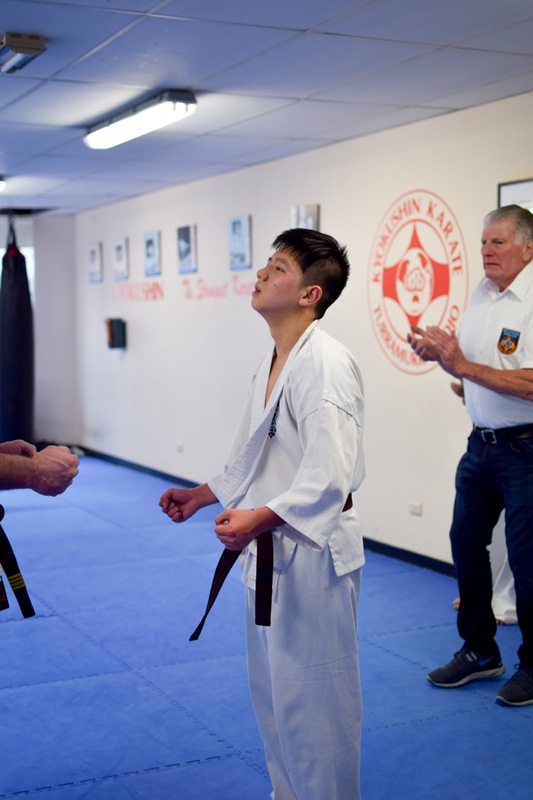 Building students from beginner through to advanced levels can be humbling for the Sensei, too. Shihan Judd Reid details in his book The Young Lions an occasion when Sosai paired Reid with his own teacher, Wada Sensei, to fight each other for a place in the All Japan Tournament. Reid overcame his mixed feelings and bested his teacher in the fight: “By the end, I was clearly the dominant fighter, and sure enough, the judges awarded the fight to me. I was selected to fight in the All Japan and Wada wasn’t. 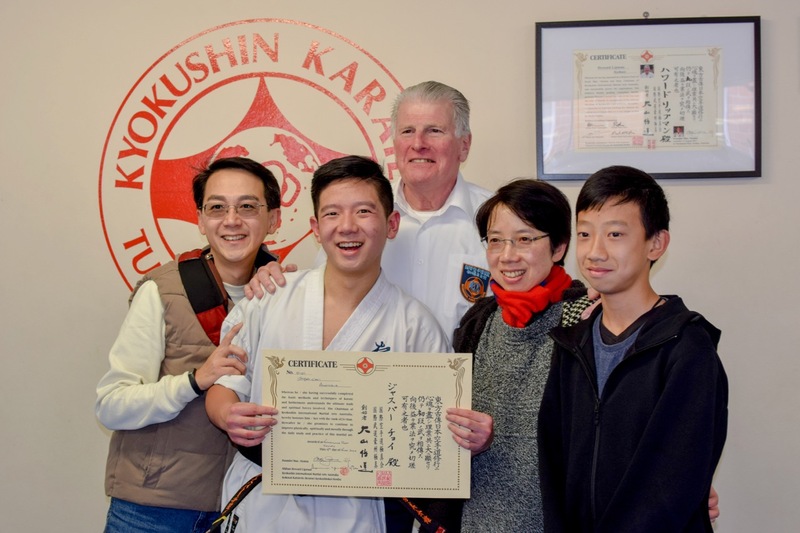 Wada Sensei graciously congratulated me … a real life story where the student finally overcomes the teacher’s own ability, through the teacher’s own efforts and training.” I can only imagine how proud Wada Sensei was of Shihan Reid after that 1990 fight. Every teacher’s goal should be for their students to one day exceed their own abilities, rather than remain forever subservient. This is in the spirit of pursuing the ultimate truth, and doing so one generation at a time. 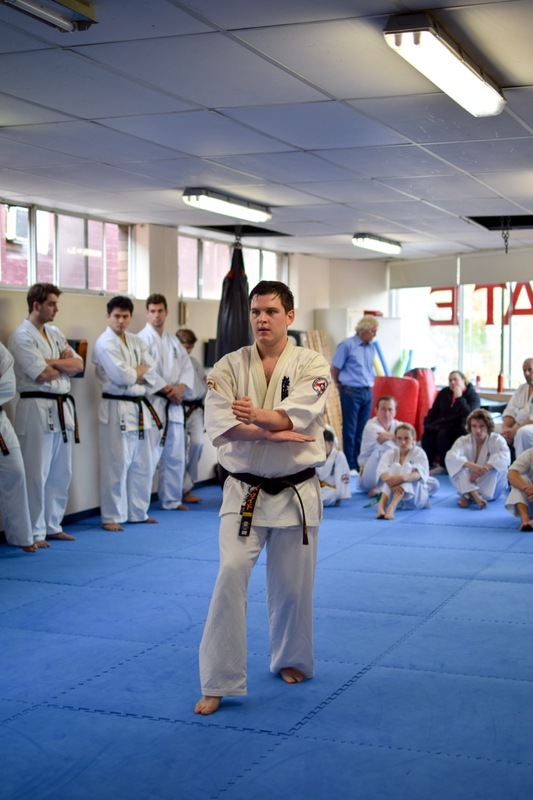 Sensei Alex leads the class during the senior grading. The Karate teacher who lives by the principles of the martial arts; who enacts them every day; is on the path to be a truly great martial artist. 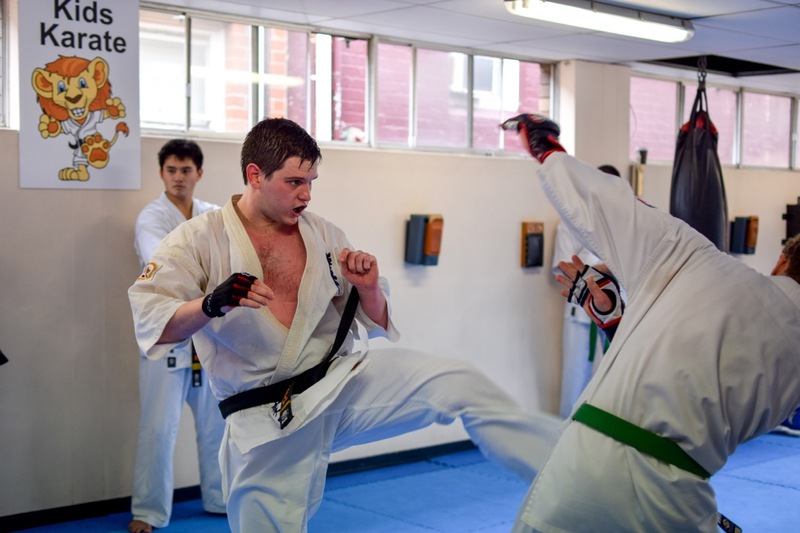 Being a Karate instructor has seen me exercise “the power of combining rigorous physical discipline with philosophical study” so that I “can readily testify to the self-conquests made possible through karate-do,” (Hanshi Patrick McCarthy). I have seen firsthand my most senior Karate instructors all live by this code. This differentiates Karate from sport – it is not a hobby or game; it is a lifestyle. The role of teaching is fundamental to the development of a martial artist. A Karate teacher has a symbiotic relationship with their students, in that they must always set a benchmark for the students to try to attain, and the students in turn drive the teacher to better themselves for they are always pursuing the standard which has been set. A teacher who is a role model to their students leaves no room for complacency, but inspires self-improvement and growth by their own example. While an instructor in the dojo will have already exhibited technical proficiency to seniors to be in that position, the act of teaching and explaining techniques will further refine the Sensei’s form as they deepen their knowledge and apply this to their practice of techniques. Finally, the Sensei who seeks to live by and impart to others the principles of the martial way, and not just perform a sport, will foster their own spiritual development as a karateka, and that of their students. Teaching has been an integral part of my own development as a martial artist for all these reasons. 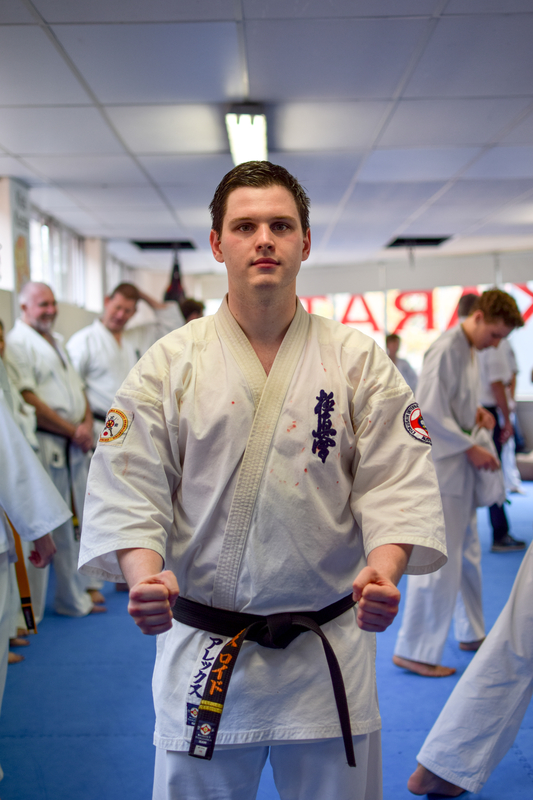 It has had a profound effect on my character and maturity, and enabled me to grow into someone who does not simply do Karate, but one who tries to be a true karateka.